these lids are the best to drink out of, but the bottle could be a little lighter in my opinion or cambak needs to make a race model that is lower weight. Purchased four of these great until came to trying to keep nozzle clean as it can fill up with junk on trails etc too bad I will stick to regular easy clean sorry . Great Bottle! Easy to use! Like jet valve nozzle! does everything as expected and more. Fits everything from my carbon cages to steel. Easy removal from cages when riding. Love the nozzle as well. No more biting on nozel to get water like other bottles, just squeeze and drink. The valve is great. No excess drippage when done drinking. Also the lockout close valve is good when transport in bags, no worry about leaking bottles. The best drinking lid on the market. The bottle is the issue, it's to stiff to squeeze easily to get a good liquid flow. 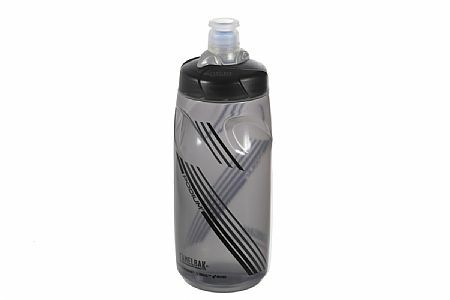 I love Camelbak bottles! This is the perfect size for shorter rides when you only want to carry the water you need. I use this one for rides 25 miles or less. A great bottle at a great price! I bought this bottle because I was looking for a good small bottle to the small space on my dual suspension mtb. It fits great and is really nice to drink out of. One squeeze sends a jet of water into your mouth, but not too much that it drowns you. I also like that you do not have to close the bottle, which is nice for mountain biking because the less time the bottle is in your hands the better! Perfect bottle for my sit up. I have a frame bag on my bike which made my taller bottle hard to use. This bottle is shorter and works well. Easy to drink while riding. I use it for holding water. I like that it holds water. I like that I can shoot water into my mouth from a distance. there's nothing I don't like about it.